Monitoring airline pressure has never been easier. Pairing a pressure switch with a quick connect coupling allows for effortless setup. A magnetic stack light and/or alarm connected to the switch alerts personnel as soon as the airline drops below your specified PSI. A protective switch boot keeps connections safe and damage free. It’s valuable to know the moment your air system loses pressure. This solution will save you money and time. 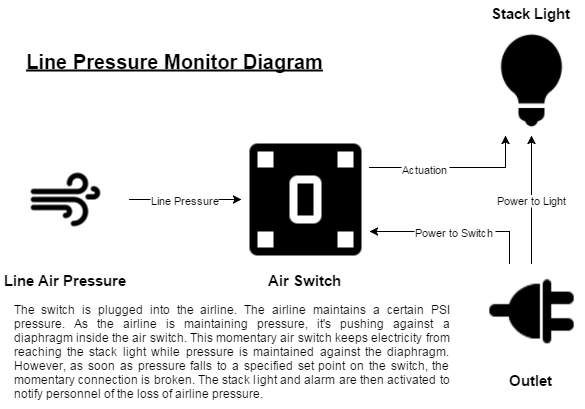 In this application, we used Presair’s adjustable pressure switch. Its broad range of setting pressures and high proof pressure rating provided the ideal switch for monitoring airline pressure. A form-fitting switch boot, made from soft PVC, provides a layer of protection for the wiring terminals of the switch. The stack light in this application comes in red and green color. A two tiered stack light can be used, with a green state and a red state. It can also be equipped with an alarm. Its 110V connection allows for bright luminosity and loud sound to alert anyone nearby of the drop in airline pressure. It also features a magnetic base, so it can be mounted to a convenient location. It’s best to know as soon as possible when air pressure is lost. It will help catch an issue faster before it becomes a larger issue. Contact us today and we’ll be happy to help with your application. **Additionally, we also tied this application into another product of ours. Nanospark allows for problem-free monitoring of alerts. By connecting our airline monitor to a Nanospark, we’re able to receive text and email notifications, as well as see historical reporting on when the airline pressure was down. For more information, please visit the website or contact us. Click an option below to view more application and product details, or contact us to inquire about your application!